Are you a first time neohome buyer having trouble deciding which Neopian land to settle down in? Don’t know which land best suits you? With nearly twenty lands, this is quite the difficult decision. It is also a very important one. After all, you do not want to build your neohome in the wrong place and be constantly moving, having to pack all of your items, move them, and unpack them. What a hassle! Not to mention the wasted neopoints. You want to build your neohome somewhere that you can enjoy for years to come, the perfect place for you and your pets. A place that fits your lifestyle, likes, and personality. This short quiz will aid you with your tough decision by surveying your likes, interests, etc. and telling you which land best fits you. Who knows, you may even learn a bit about yourself. With the help of this quiz, you will have your dream home built in your dream place in no time! All you have to do is read the following questions and write down the letter that corresponds with your preferred answer. Simple, right? -Insert nod here- So then let's find out which Neopian land is perfect for you! a) Gazing at the stars. They’re just so pretty, and finding all of the constellations is so much fun! b) Playing in the snow. What’s not to love about snow forts, snowball fights, and making snowfaeries? c) Lying on the beach. Why run around when I can just chill in the sun all day, listening to the waves lapping against the shore? e) Scaring unsuspecting passerby. The looks on their faces is classic! f) Swimming around. There are so many things and places to explore! a) A Grundo. They are out-of-this world and unique. b) A Bruce. They love playing in the snow. c) A Mynci. They are tropical and love relaxing. d) An Eyrie. They love adventure! e) A Hissi. They could scare the pants off anyone! f) A Koi. They are great swimmers and love exploring. a) Lost in Space Fungus. You enjoy the space scenery in the game. b) Snowball Fight. Snowball fights are so much fun! c) Mynci Beach Volleyball. Nothing like a laid-back game of volleyball. d) Escape From Meridell Castle. What an adventure! e) Carnival of Terror. Anything with “terror” in its name is fine by me. a) Space gear. Nothing better for exploring and learning about space than that. c) Shorts, a T-shirt, and sandals. That’s as comfortable as it gets, perfect for relaxation. d) A tunic and your sword. Easy to move in and protective. Perfect for an adventurer! e) A Hubrid Nox costume. How could someone NOT be scared by this?! f) A scuba suit. Swimming is even easier in this, and you’ll be able to explore the sea even better! a) A kreluberry. You can’t find anything like this on Neopia! b) A snow puff. It’s nice and cool--and even better, made with snow! c) A doughnutfruit. It’s tropical and easy to eat. d) Some stew. It gives you tons of energy! f) Any kind of fish. The seafood taste is amazing! a) Booktastic books. They have a lot of information on space. b) Snowflakes. They show how pretty snow is. c) Bottles of sand. There’s a lot of that on beaches; I won't have to walk very far. d) Potions. You come across tons of those on your adventures! e) Meepits. Everyone is scared of them! f) Seashells. They are fun to look for when you are swimming. d) Who has time to worry about weather when there are adventures to be had?! a) Gorix. I bet he knows a lot about space! b) Armin. He would be fun to play with in the snow! d) Jeran. He has had a lot of adventures! e) The Ghost Lupe. Now HE knows how to scare people. f) Isca. I bet she has traveled the whole sea! Plus, we can talk about our seashell collections! Count the amount of each letter you have and find your result below. Kreludor best suits you. You love everything about space, especially learning about it. You are unique (some call you strange) and like things that are as unique as you. 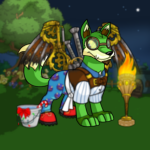 Kreludor is perfect for you because it includes many unique items, pets, and places. More importantly, it offers that perfect space environment you’re to study! Terror Mountain best suits you. You love the snow and cold weather. You also love having fun, especially when snow is involved. Despite your preference for the cold, you are a warm, friendly person. Terror Mountain is perfect for you because, well, it’s filled with your favorite thing--snow! It’s also filled with friendly, good-natured people that love fun like you. Mystery Island best suits you. You love the simple things in life like relaxation. Some may even call you lazy! You also have a love of sun and warmth. Mystery Island is perfect for you because it is laid back with plenty of beaches and a warm, tropical climate--perfect for relaxing all day. Meridell best suits you. You love adventure and excitement and you can always be found relentlessly chasing it. You are energetic, in an exasperating way for some. You are also an overall upbeat person who doesn’t sweat the small stuff. Meridell is perfect for you because adventure is lurking around its every corner, whether it be in the form of cheese rolling or avoiding being eaten by Turmaculus. Every day holds new excitement! Maraqua best suits you. You have a natural love of the sea and everything in it. It’s where you feel truly at home. Though some may consider you overly obsessive, you don’t care; you just love exploration, whether it be in the form of collecting shells or journeying into sea caverns. You are an adept swimmer, which you should be, considering how much you love it. Maraqua is perfect for you because, well, it’s in the sea! It’s filled with all kinds of nooks and crannies for you to explore. And that brings us to the end of the quiz. I hope it has helped in deciding the location of your future neohome. Remember--whether you enjoy the sea, space, or all things scary, there’s a land that’s perfect for you! ... Well, what are you still doing here?! Go and get working on your neohome!